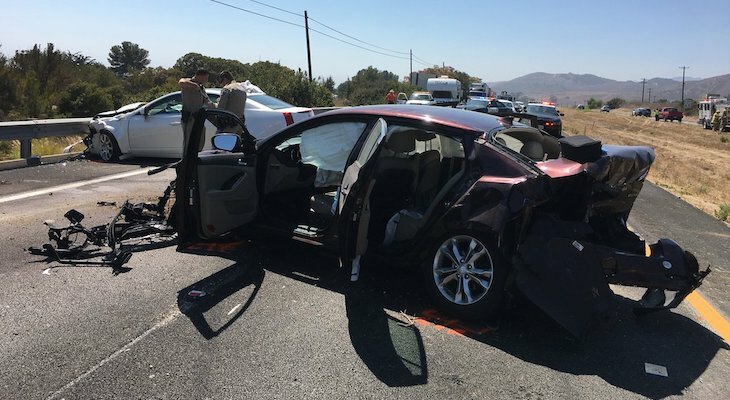 A wrong-way driver on Highway 101 southbound collided with two vehicles near El Capitan State Beach causing two major injuries on Wednesday afternoon. At 2:20 p.m., Santa Barbara County Firefighters responded with California Highway Patrol and AMR to just north of the El Capitan State Beach exit. Crews found three vehicles had been involved in a collision with two of those vehicles struck head-on. A sedan was traveling in the wrong direction, northbound in the southbound lanes. 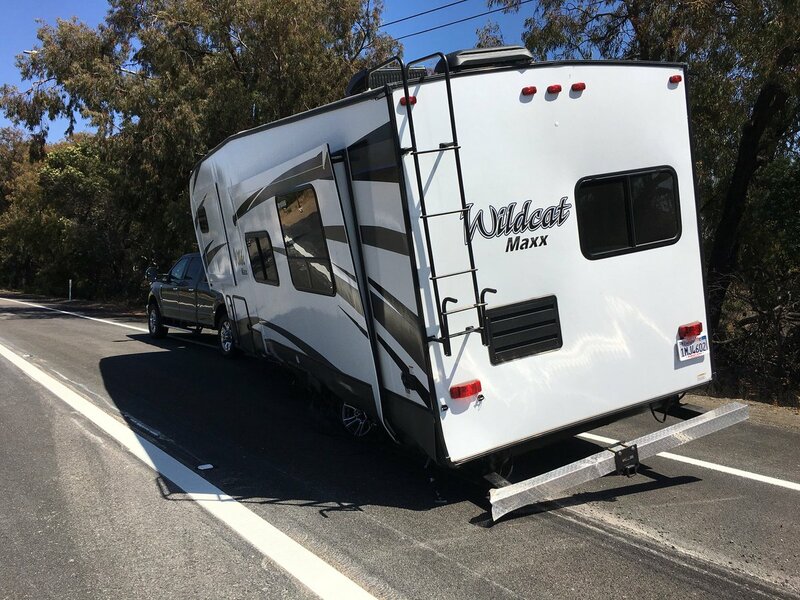 It initially a 30-foot trailer being towed by a pickup truck, causing the truck to lose control and end up in the southbound offramp for El Capitan Beach. There were two passengers in the truck who were uninjured, but damage was done to their truck and trailer, said Captain Dave Zaniboni. The sedan continued on and struck another vehicle head-on approximately 100 yards north of the first collision. There were two people inside the struck vehicle, a 60-year-old female passenger complaining of major injuries, and a male driver who was uninjured. The female driver of the wrong-way sedan also suffered major injuries, said Zaniboni. Both patients were transported to Santa Barbara Cottage Hospital via ground ambulance. Both lanes of Highway 101 southbound were closed since 2:20 p.m. causing a significant delay. Currently, one lane is open. CHP is investigating the cause of this incident. 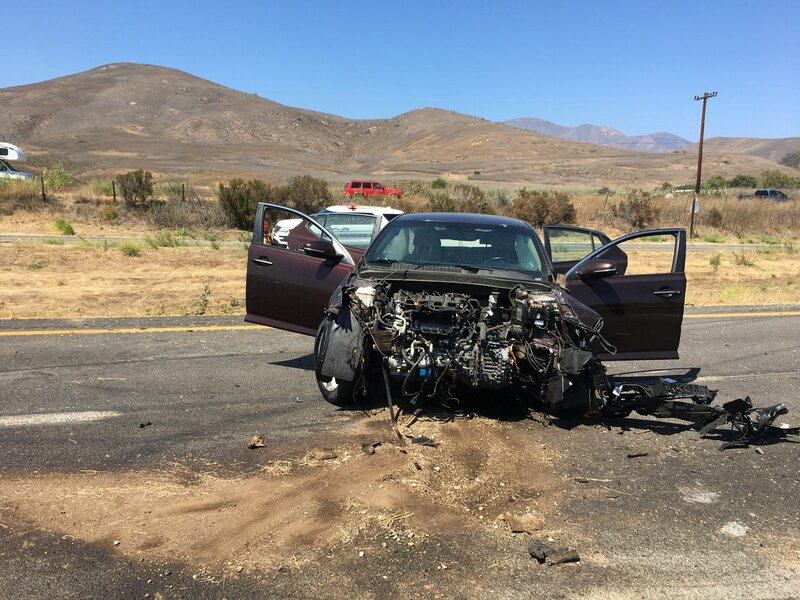 Below is the report from California Highway Patrol at 4:48 p.m.
On August 8, 2018, at approximately 2:15p.m., a collision occurred on US 101 Southbound north of El Capitan State Beach. Party #1 was traveling northbound on US 101southbound, north of El Capitan State Beach driving a Kia Optima. Party #2 was traveling southbound, on US 101 north of El Capitan State Beach. Party #3 was traveling southbound, on US 101 north of El Capitan State Beach. Party#1 entered US 101 southbound from El Capitan State Beach off-ramp, driving wrong-way, and collided into Party #2's Ford F350 towing a trailer. After the first collision the Kia continued northbound in the southbound lanes and collided into Party #3's Cadillac. Emergency personnel arrived on scene and transported Party #1 and the passenger to Vehicle #3. All parties were taken to Cottage Hospital for injuries sustained from the collision. Information is limited because multiple parties were transported. US 101 southbound, north of El Capitan State Beach was closed for approximately 40 minutes. It is undetermined if anyone involved in the collision was under the influence of alcohol or drugs. This collision is an ongoing investigation. Injury traffic collision on Highway 101 southbound at El Capitan Ranch Road, a wrong way driver caused a 4 vehicle pile up. One person in critical condition, one with minor injuries, Red Tag, Yellow tag. Who hits a 30' trailer and then continues on another 100 yds. to hit another vehicle? Possibly DUI? Ya think? Oops I see that it was a Kia. Never mind. What kind of car is that burgundy car? The front end is shredded and airbag deployed but the windshield is intact and the dashboard doesn’t look like it collapsed into the driver area. Looks like a pretty safe car. Just terrifying to imagine. What should one do if there’s a wrongway driver and you’re both in the fast, the passing lane? Per CHP Possible DUI involved.